The R If Else Statement is an extension to the R If Statement (we already explained in our earlier post). We know that, the If statement will execute the statements only when the given condition is true and if the condition is false, it will not execute any statement. From the above code snippet, If the test condition / Boolean expression present in the above syntax is true then True statements will be executed, and if the condition is false then False statements will be executed. Let us see the flow chart for better understanding. 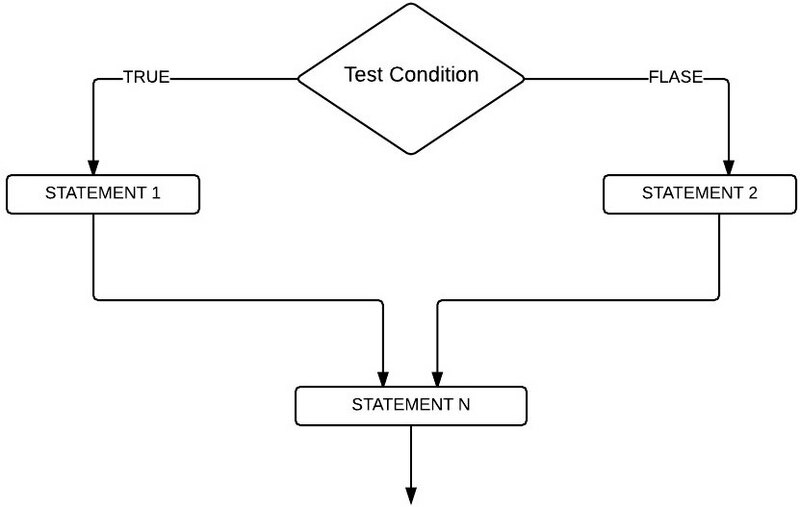 If the condition is False then STATEMENT 2 is executed followed by STATEMENT N. Here, STATEMENT N is executed irrespective of test results because, it placed outside of the If Else condition block and it has nothing to do with the condition result. This program allows the user to enter their age and it will check whether they are eligible to vote or not using the if else statement. In this program we are going to place 4 different print statements. If the condition is true we will print two different statements, and if the condition is false we will print another two statements. ANALYSIS: User enters his/her age. If the age is greater than or equal to 18, Statement 1, Statement 2 will be printed, and If the age is less than 18 then Statement 3 and Statement 4 will be printed as output. Outside the If Else block we placed one print statement (Statement 5), and irrespective of condition result this statement will be executed.